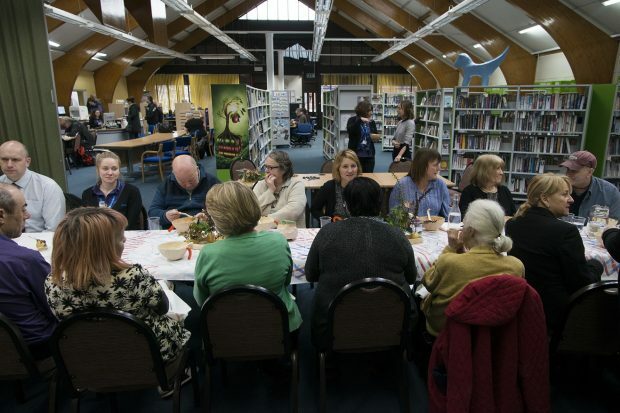 Having heard we were awarded the LOFE project funding, at Sefton Libraries we are excited to put into action the plans that made our bid successful, namely encouraging adults who are socially isolated or experiencing poor mental health to enjoy participation in their local community. We will create a ‘human library’ where volunteers can ‘gift’ their talents or experience to someone who needs their time and support. To uncover these talents, we will be hosting a series of creative programmes, which in turn will build a sustainable bank of volunteers who can share their ‘gift’ at any time. The gift of volunteers can be anything that helps isolated adults to feel engaged; from one-to-one sessions with adults with poor mental health, to preparing and hosting community meals and everything in-between. The project will train volunteers to equip them with social prescribing techniques, including Making Every Contact Count. We haven’t created this ambitious project on our own, having worked in close collaboration with independent creative producer and local resident, Maria Brewster. She has real pedigree, having played a key role in social arts projects such as the Granby Winter Garden with Turner Prize Winners Assemble, with socially conscious arts organisation Superflex, and with the highly respected visual artist, Jeanne van Heerwijk. Throughout the project, we will be chronicling its progress through social and digital media, using art, imagery and videography to share this compelling project and make it part of the wider narrative of the active role we already play enhancing the social well-being of Sefton’s residents. We are launching the project on 14th July at Bootle library with the Mayor of Sefton. We cannot wait to get started. To keep up to date with activities in Sefton Libraries, follow them on twitter.